It’s a major misconception that plastic surgery is just for women. More men are opting for facial cosmetic procedures because we live in a culture that admires youth and beauty. Many men get plastic surgery done to stay competitive in the job market as well. Climbing the corporate ladder is made easier when a man looks youthful and fit. Women aren’t the only ones who want to look and feel good. Men do as well. 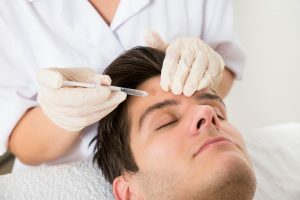 In this blog, Dr. Cecil Yeung explains the top cosmetic facial procedures for men, and how these surgeries can make men look more fit, youthful and masculine. An eyelid lift is a surgical procedure that removes excess skin and fat from the eyelids. It can be performed on the upper or lower eyelids or both. As a person ages, the eyelids lose elasticity and begin to droop. The eyelid crease drops, and this results in a hooded eyelid over the eye. An upper eyelid blepharoplasty procedure removes skin and fat through incisions. A small stitch is then made that brings the skin together to create an eyelid crease. The final results are more youthful-looking eyes without any hooding. Lower eyelid surgery involves skin incisions made right below the eyelash line or inside the eyelid. Fat is then taken out or added, depending on the client. If a person has puffy lower lids that impair vision, fat is removed. If wrinkles are an issue, excess skin is removed and fat can be added to correct sagginess. Though the incisions are minor, the results are dramatic. Many men undergo a rhinoplasty to change the contour and/or size of their noses, so it’s more in proportion with the rest of their face. It’s key for males to choose an experienced plastic surgeon who has worked with men, to avoid a feminization of the nose, which would look unnatural. Many men opt to have a chin augmentation done at the same time, to enhance the shape of the chin and improve their facial profile. A small chin is a facial feature associated with weakness and lesser masculinity, while a larger chin is associated with manliness and strength. Chin augmentation is a surgical procedure to enhance the shape of the chin. A small incision is made and an implant is strategically placed to augment the shape of the chin. Another method is to reposition the jawbone and perform liposuction along the jawline that creates a stronger, sculpted chin that projects strength. Dr. Cecil Yeung is a double-board certified plastic surgeon who specializes in cosmetic facial procedures for men in Houston. Dr. Yeung understands the intricacies of male facial anatomy and musculature so that his surgeries produce natural and masculine looking results. Clients there receive exceptional care in a luxurious and private atmosphere. If you’d like to learn more about men’s facial plastic surgery, contact our office today to learn more from our friendly staff. You can also get started by filling out the appointment request form right on this page. ©2016 yeung institute, all rights reserved.